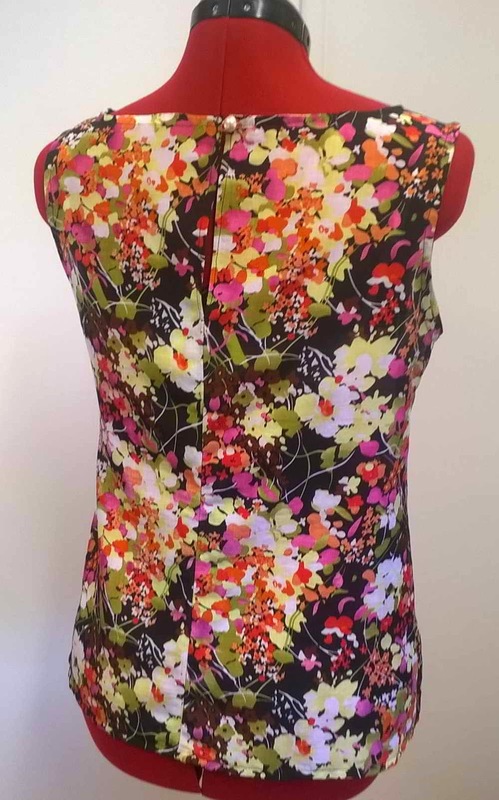 This is my second finished piece in my entry for the Wardrobe Contest on Pattern Review. It is again from the latest women's Ottobre issue 02/2015. This time pattern no. 1 "Grain Field Top". Can't quite get the connection of the name to the pattern. any clues?? As this is part of my contest entry I haven't got the official photos yet but have got some on Diana. This top is lovely. The fabric was bought from a remnant bin - a cotton/silk blend and has been one of those pedestal pieces I was afraid to cut into. I love the fabric, the colours, pattern and the way it feels.... yummy! I have reviewed this pattern here, so won't repeat a lot of it here. The basics are I lengthened the top, used a button/ loop closure at the back seam instead of an invisible zipper and had problems with the fit around my upper back.... boo hoo!, I thought it would end in tears, but I managed to fix the issue well enough by letting it out a little at the side seams. Lesson learnt - when it is a pedestal fabric then muslin it or add extra to the seam allowances!! I also love how it goes with my RTW cardigan that the wardrobe is based on. Ciao kittens... another top soon... on a roll! Beautiful fabric. Lovely top. Nice match with your cardi. Your top is gorgeous and looks fantastic with the cardigan! 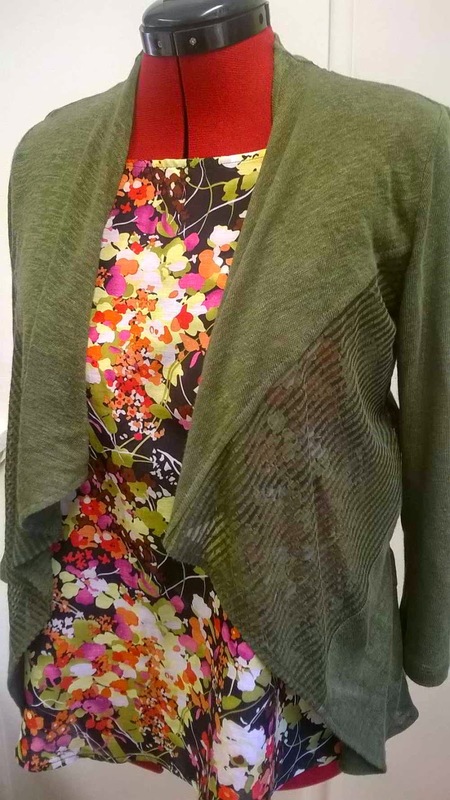 Really nice and it goes beautifully with the cardi! Very pretty.... love the colors. Love it!! That print is so juicy. Your wardrobe is shaping up nicely. That looks like a lovely pattern and the fabric is gorgeous! Pretty! and I think it's called the "grain field top" because the patterning looks like it does when you fly over grain fields. Lovely blouse, the colours are so clear. The fabric is so pretty and the top is lovely. It goes with the cardigan perfectly. 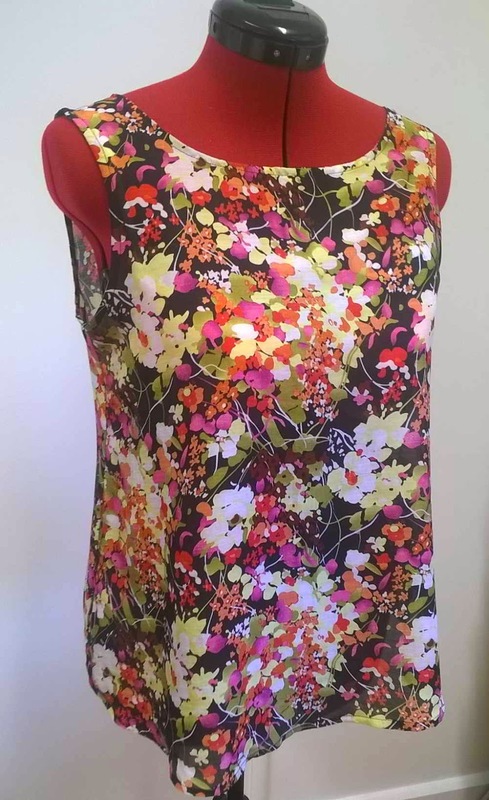 Beautiful fabric and this simple top shows it off very well. Lovely fabric! That's a great top and goes well with your cardi. Very cute! It will be so easy to dress up and down. Gorgeous top Sue. It goes so nicely with your cardigan. Lovely. Your collection is coming together so nicely. This is a beautiful piece, and with all the colours in the lovely print, looks as if it would coordinate with so many other pieces.